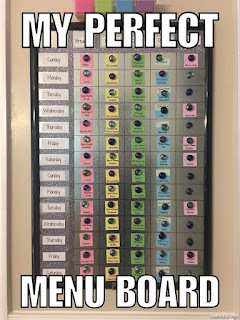 I've seen dozens of menu planning boards pop up all over Pinterest lately. 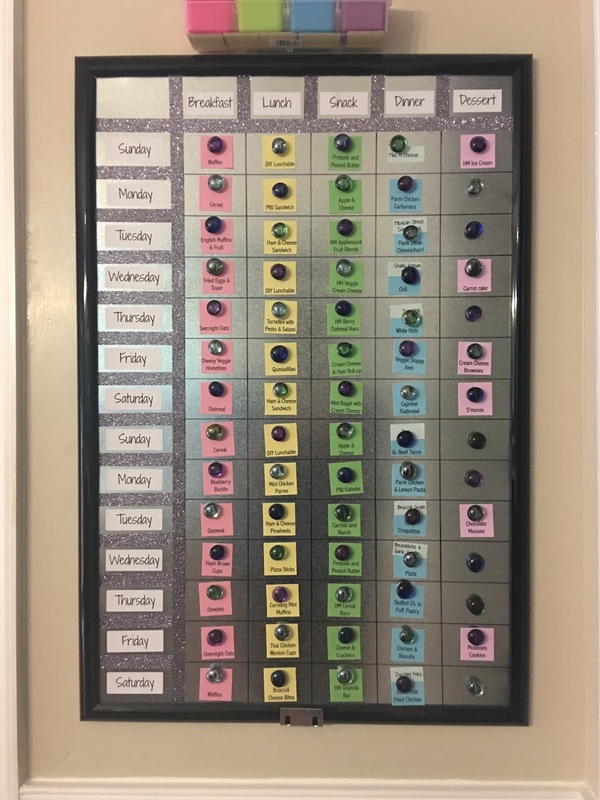 There are simple dry erase versions in glass picture frames and ones with a dozen categories so you don't accidentally eat fish 2 nights in a row. I wanted one- but one that fit my exact needs. 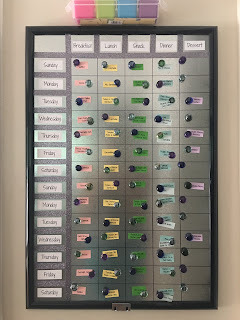 I needed a way to organize my meals and the thoughts that go into them. I cook 3-4 meals a day. My kids go to school and each need a breakfast in the morning, and a packed snack and lunch every weekday. My husband goes to work and prefers that I pack him breakfast, snack, and lunch every morning. That's a lot of food to organize before 7:30am- when I leave to take the kids to school. Husband's has to be done by 4:30am. It was time for a solution that simplified my meals. 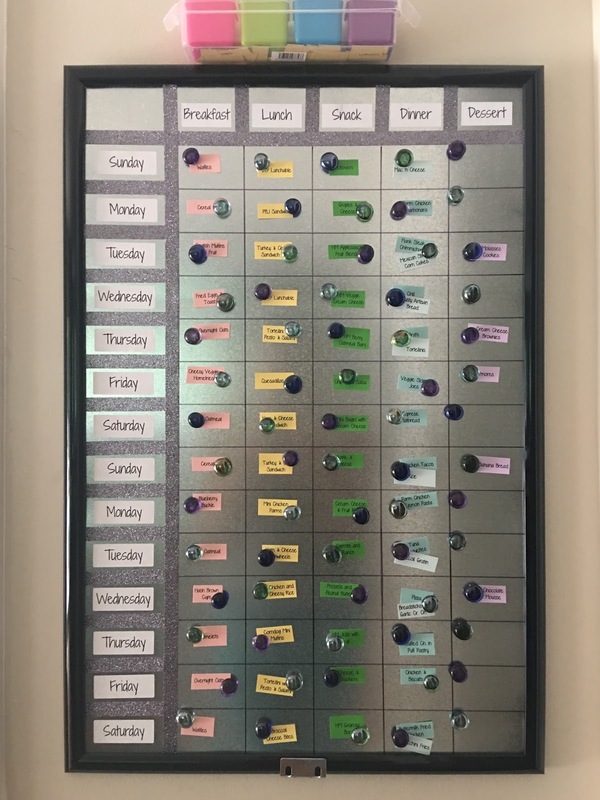 I used to do the basic dry erase board but it seemed that no matter how much variation I started with, within 6 months we were back to the same 15 or so meals. Boring. I'd forget about things I'd made or forget how I made them, and they were lost to the abyss that is my mind sometimes. For years I didn't do anything more than a notepad on the fridge. But the exact same thing happened. So I made a goal. Spend the first half of 2017 working on my recipes and writing them down. That latter part was very hard for me. Cooking took twice as long because I had to stop to measure and take notes with every move I made. You see, in 2008 I read the Joy of Cooking pretty much cover to cover. I found myself with a LOT of free time as the stay at home mom to a baby who slept 21 hours a day. Husband, who was a boyfriend at the time, worked a ton and had a lot of friends. He wasn't home much. We were very young and lived in an apartment near no one that I knew in a time before Facebook had local events to meet other new moms. Saying I was a tad isolated is an understatement. To stave off the boredom, I decided to learn to cook from scratch. Fast-forward 8 years and I rarely use recipes now. It's become second nature and cooking is my favorite time of the day. In the 8 months since I started writing down my recipes, I've amassed a few hundred that we love. Some old classics and some modern recipes with a twist. It's a solid collection that I'm very proud of. They all got typed up and put into sleeve protectors in binders. 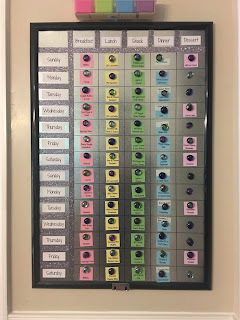 Now I just needed a way to organize them for use- and we're back to the need for a menu board. I looked on Pinterest and found a couple that were close to what I needed but nothing exact. So, I scoured around in the garage and found a piece of sheet metal that came from who knows where. No one seemed to remember where it came from so it wouldn't be missed if I screwed this up royally. I wanted this board as big as I could get it to hold at least 2 weeks of 5 meals per day. 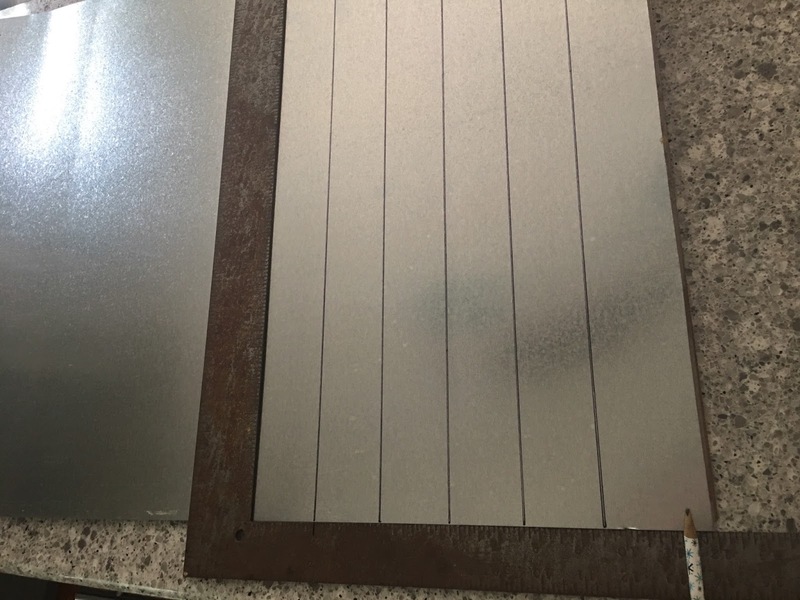 The metal was 20" wide and nearly 8' long. I found a frame at Walmart that was meant to hold posters that were 20" x 30". The perfect size for the wall where the board would go. It would require me to cut the metal only twice to make it fit. 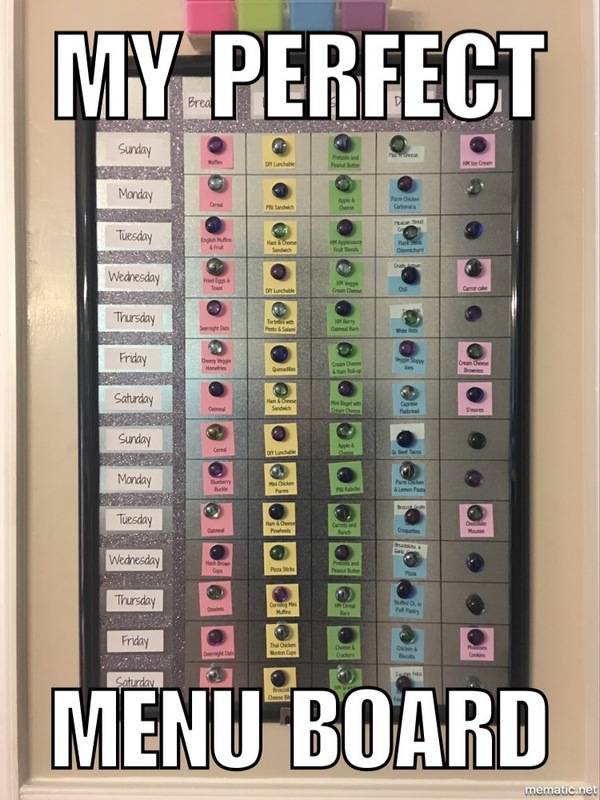 While at Walmart I also found glittered tape, glass gems, adhesive labels, magnets, and a desk organizer that I planned to re-purpose into storage for my menu cards. 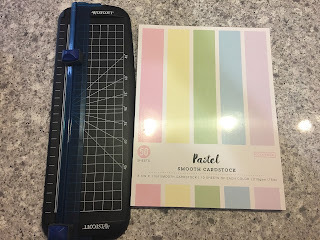 I had cardstock and scissors at home to make the cards. 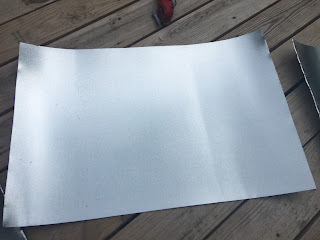 The first thing I did was measure and cut the metal. The bottom edge wasn't straight so I used my trusty square to get it right. I used the paper from inside the frame to measure the metal piece. I popped it into the frame with the plexiglass behind the metal to provide a bit more stability. The next thing I did was measure out my lines for the boxes. While the metal was still in the frame, I marked the corners so I knew how much space I lost behind the frame. I wanted the boxes to be as even as I could get them. The pencil in the photo is pointing to a very light mark showing that lost space. now before we go any further, ignore my rusty square. I love that thing and can't bring myself to replace it yet. After we lost everything to a house fire in early 2010, that square was the first tool I bought and used it to get my creativity back. She measured fabric for Halloween costumes, paper for making homemade cards, sizes of rolled pie dough, and even helped me redo a piece of furniture I got for free. She still works perfectly and I can still read the measurements. She gets to keep her job for a bit longer. I needed 6 boxes across: day of the week, breakfast, lunch, snack, dinner, and dessert; by 15 boxes tall: meal, and 14 days worth of space. My measurements aren't important as its unlikely you'll need the same ones for yours. I marked the lines with Sharpie. I used the glitter tape to separate the categories and just to make it look a bit prettier. It was totally unnecessary but I love it. The address labels were used to mark the categories. It took me 3 tries to get them formatted properly. The company isn't joking when they say to print a test sheet on plain paper. I had to trim the ones for the meals to make them fit. That night I laid out wax paper and newspaper to glue my magnets onto my glass gems. Did you know E6000, my favorite glue ever, comes in black?! I didn't and accidentally grabbed that tube. Figures. In the end it didn't matter- the gems glued and you couldn't see the black. 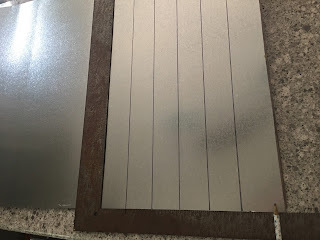 The frame is hung by the tab on the back, but because it is quite a bit heavier with the metal and magnets, I found a corner hinge laying around and bent it to support the bulk of the weight of the frame from the bottom. I took a second hinge and flattened it. It sits above the frame and my desk organizer, with the help of 2 glued-on magnets, attaches there. I used Excel to print out the menu cards. My first go round looked like this. I cut them with scissors so they were uneven and once on the board you couldn't see them with the magnets in the way. 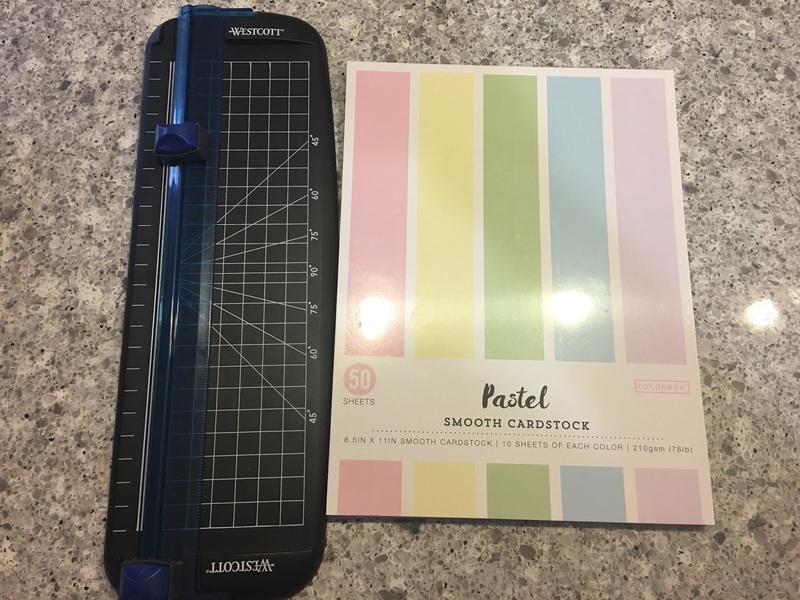 I bought a paper trimmer and more cardstock, since I exhausted my supply the first time around. The second time was exponentially more successful. It looked uniform and organized. The dinner category has 2 sets of cards- dark blue is for main courses and light blue are the sides.